As the only Certified Orthopedic Manual Therapist (COMT) on the island, Trish brings a wealth of knowledge and experience to her patients. Her zeal for learning and teaching ensures that she is always at the forefront of excellence in her work and is on faculty for Maitland Australian Physiotherapy Seminars (MAPS), the largest evidence-based educator in the country. Awarded the prestigious Robert Sprague Award for Clinical Excellence in 2016, she is committed to the advancement for excellence in patient care. She is also currently engaged in advancement of her education by pursuing a Fellowship in Orthopaedic Manual Therapy. Trish strikes a balance between the art and science of physical therapy when she works with patients for Post-Surgical Recovery, Orthopedic Care, Sports Rehabilitation, ACL and knee injuries. She emphasizes the importance of individualization of a rehabilitative plan of care, customizing each patient’s treatment plan to their own specific goals. At the age of 17, Trish blew out her knee and became a physical therapy patient and as a result was able to return to competitive sports. That experience largely shaped her career path. It helped her understand how important it is to focus on patient’s goals, widely varying for each patient. 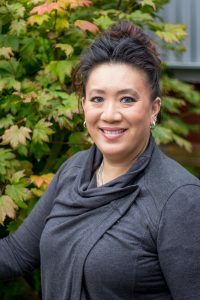 Over her nearly 20 years of experience, her love of orthopaedics and sports medicine has expanded to realize that sports rehabilitation doesn’t just apply to sports per se, but to all those who are participating in the Sport of Life. Her philosophy of educating patients and understanding the true root of the problem has allowed her to create open communication with patients resulting in meaningful relationships and more successful results that last far beyond their treatment plan. Trish is the only practicing COMT on Bainbridge Island and one of only 803 in the United States. SportsMetrics is the most researched ACL injury prevention program to date.